A former Newent Community School artist is delighted to have featured in one of the world’s most prestigious exhibitions. Following her success at the Royal Academy of Arts’ Summer Exhibition in London, Sarah Gwyer, who attended the Watery Lane school from Year Seven to her A’ Levels in 2003, and who has previously been shortlisted for a national artist of the year award, is now working on fresh celebrity-inspired creations, some of which will be on display in Gloucestershire. 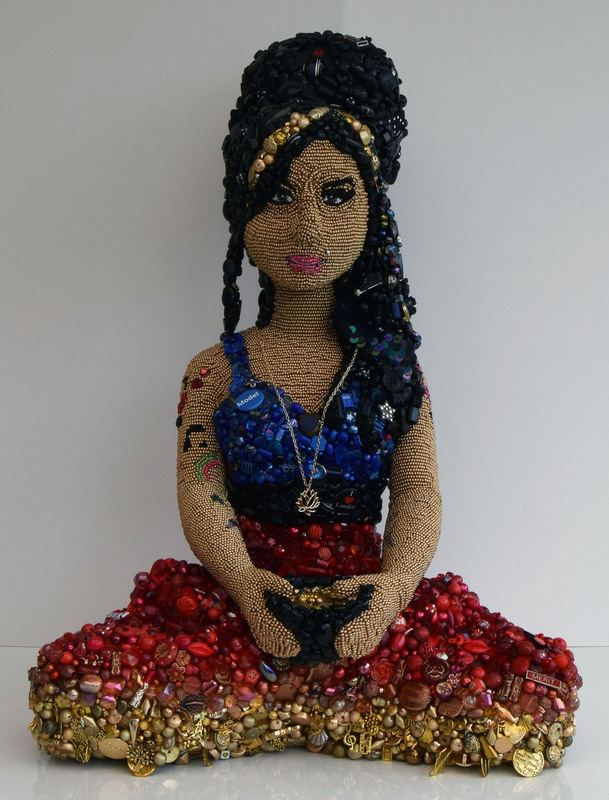 Sarah was selected to show at the Royal Academy of Arts’ Summer Exhibition in London, her ‘Amy Remixed’, a mixed media sculpture of Amy Winehouse, was displayed alongside works ranging from paintings, drawings and sculptures to film and photography, by both internationally acclaimed artists and other rising stars of the art world. It sold in the first week for a four-figure sum and Sarah is also thrilled at the new opportunities displaying her work to such a large audience is now bringing. 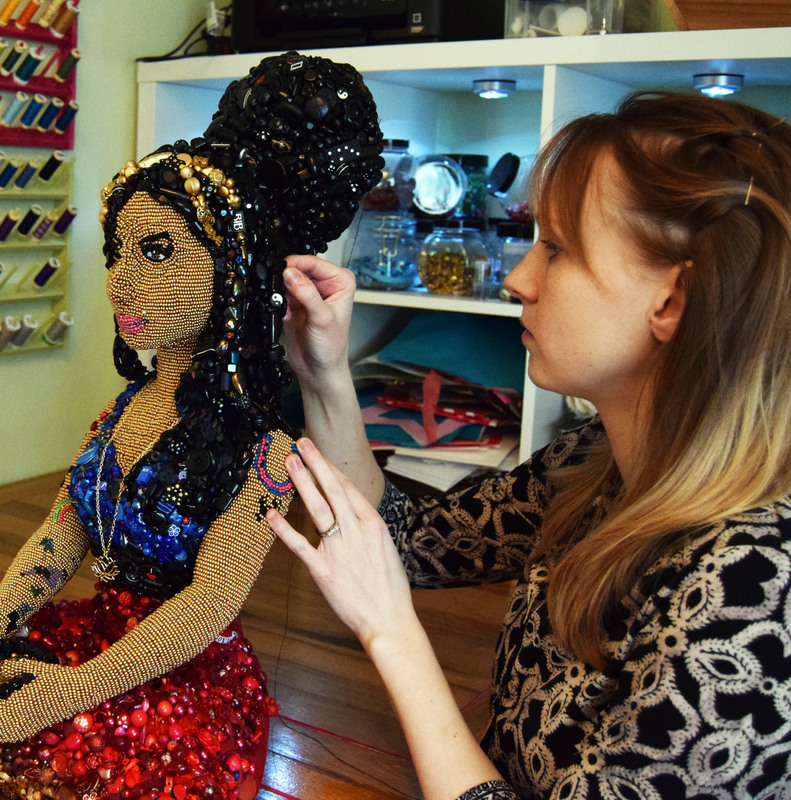 New pieces Sarah is working on following her exhibition success include two beaded sculptures, one featuring Beyoncé while pregnant with twins. After leaving Newent, Sarah studied Fine Art in Cardiff and then did a Masters in Printmaking at the University of the Arts, London. By the time of her graduate show she was exhibiting simultaneously in London and New York. 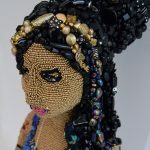 Working in textiles, sculpture and print, her work reflects themes of celebrity, consumerism and commercialism and features familiar faces and pop imagery. She says she aims to merge the boundaries between art and craft practices, pushing traditional ways of working to new levels and audiences. 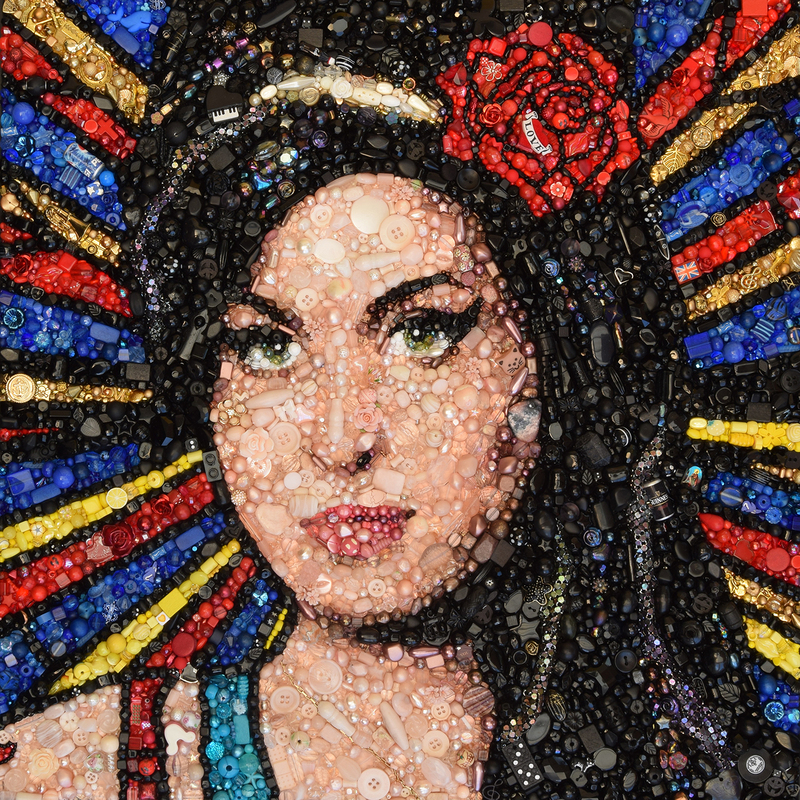 She hit the headlines in 2009 for her debut exhibition on the theme of modern day icons which featured Princess Diana, Princes William and Harry, Kate Moss and Kate Middleton with halos. 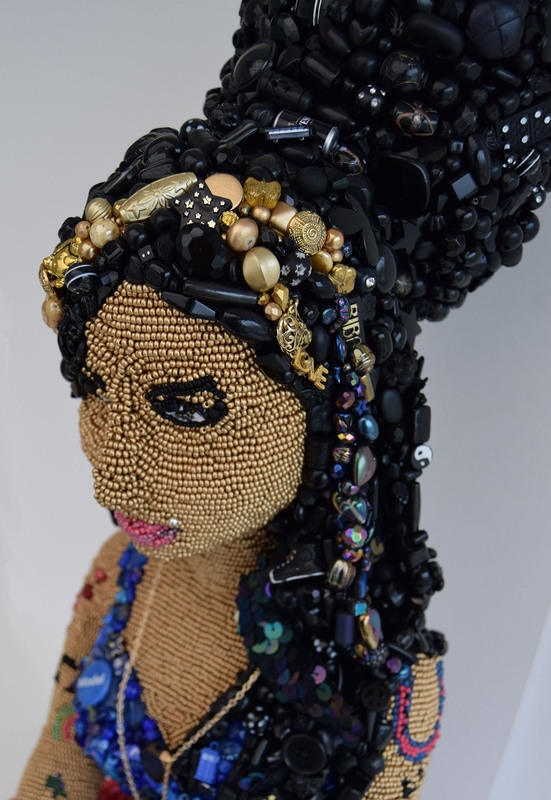 In 2007 she was shortlisted for the prestigious Welsh Artist of the Year award for her sparkling bead portrait of Charlotte Church. The artwork for the Royal Academy exhibition is selected by a committee of Royal Academicians which this year was chaired by Eileen Cooper. 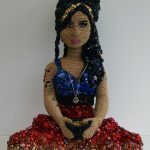 Sarah, who says she aims to inspire others and draw more attention to craft ways of working through her creations, was selected by Eileen Cooper R.A. to feature in the exhibition and by Yinka Shonibare R.A. for one of his rooms. The exhibition, which has just ended, ran at the Royal Academy in Piccadilly. 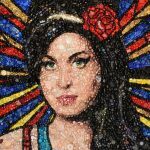 Following her success there a fresh Amy Winehouse-inspired piece can be seen at various locations around Gloucestershire this Autumn as part of Big Heart 2017.